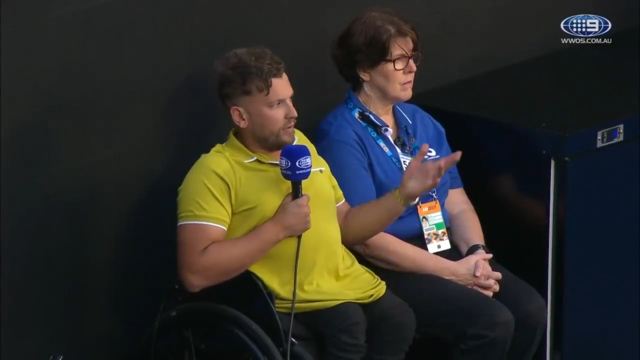 Australian wheelchair tennis star Dylan Alcott has delivered a message of hope and inspiration to children with disabilities after coming back from a set down to beat all-time great David Wagner, who has won six grand slam titles, 6-7 6-4 7-5. The win vaults Alcott into the final, where he awaits the winner of the last remaining round robin clash between Wagner and Alcott's doubles partner Heath Davidson. Playing in oppressive heat, Alcott did it the hard way dropping a first set tiebreaker before charging back to finish the stronger, finally breaking the American champion as he served to stay in the match. Afterwards Alcott thanked a large crowd for watching him and Channel Nine for broadcasting the match live, before addressing the inspiration that drives him to work hard for success in his chosen sport. "It’s hot and look at how many people stuck around, it’s unbelievable," Alcott said. "And I did it, so I’m stoked. "I almost want to cry, because if you’re here, look how many kids with a disability’s here and not everyone has an opportunity to come to Melbourne Park and see that but now they do on TV. "As I said you might not get out there and play in the Australian Open but you can still get out there and do whatever you want to do." Alcott said he was humbled to have the ability to inspire people living with disabilities, pointing out that he didn't have a role model in mainstream elite sport to look up to when he was growing up. "It means everything. I didn’t have anyone like that, cause when I was brought up there was no one in mainstream, and that’s why I do what I do," Alcott said. "I want to win the Australian Open, yes, but that’s the main reason and now I’m in the final so hopefully on Saturday (he can), first I need an ice bath though because it is hot." Alcott's place in the final gives him the amazing opportunity to win his fifth consecutive Australian Open title after clinching his first grand slam title at Melbourne Park in 2015. Of the four he has won so far, 2018's title was the most challenging, with Alcott later revealing he had to discharge himself from hospital, where he was being treated for a cellulitis infection, to compete in one of his matches.